Regardless of the bubbling social entrepreneurship research, a generally accepted concept for this term. In fact, the current limited conceptual framework undermines the bases of this entrepreneurship and hinders rigorous scientific progress in this area of study. 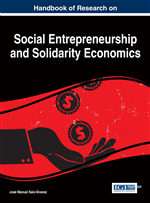 In this paper, the authors attempt to fix the conceptual framework of the social enterprise, for which we have opted for an integrated, broad open view of the concept, given the heterogeneous nature of its agents and its continuous evolution, as well as the type of social enterprises that may be inferred from it. They close by exploring the keys to success of these enterprises, certain specific factors of which only a few are shared by traditional enterprises. By applying a qualitative and quantitative methodology, which they triangulate, this analysis is implemented for Extremadura (Spain), a region that embarks on fostering social entrepreneurship based on the current view in a territory with a thin social enterprise network. The notion of Social Enterprise (SE) runs into the absence of a definition and, when one tries to define it, it varies according to the different country realities. There is not a single agreed upon definition in the academic, professional and public authority world due mainly to the fact that the legal, cultural, economic, and historic differences hinder this objective, but also due to the complex and interconnected realities of today’s society, constantly generating new projects that occupy the line between the SE, other entities, especially those known as the Third Sector –or Social Economy in several European countries-, and traditional businesses (Chiliova et al., 2011). Besides, many of them are dynamic projects that evolve with time –starting as social projects, or businesses that become SEs when they identify a social challenge to undertake. The many businesses already committed to Corporate Social Responsibility (CSR) blur the SE boundaries even more, although we could consider CSR the first generation of enterprises moving towards a New Economy, while SEs represent a second generation advancing its principles. (Troncoso, 2014). This symbiosis between the SE and its context makes exporting SE models from a country or continent to another successful only if rooted in the importing environment; otherwise, it becomes a passing trend. That is why it is impossible to map out SE entities even in the same continent such as Europe. The polyhedral reality of the SE is due also to the different understanding of the term itself from the theoretical viewpoint of the different schools of economic thought where each one originates. Nevertheless, and though the richness and broadness of the SE concept may be one of the keys to these companies’ success, it is essential to mark the SE territory for very different reasons. In the first place, as a formula to emphasize the focus of these businesses towards a social objective.1 Also, in order to help understand this type of agent, since the social enterprise lacks visibility and recognition, as the Social Entrepreneurship Initiative (2011) for Europe points out, which makes it even worse, giving the diversity of existing SE concepts (European Commission, 2014). This exhaustive knowledge of the phenomenon would benefit from a better analysis and comparison of the existing data, which, at the same time, would help adapt and coordinate public policy. Finally, the economic crisis has wrecked the current capitalist model centered in the short term and the maximum profit as the main business objective. Porter and Kramer (2011) blame this mostly on outdated treatment of value creation in business. The harmful social and economic effects of this crisis are a stimulus to formulate an alternative proposal to improve current capitalism. From a balanced viewpoint between social and economic impact, we will enjoy a more cohesive and sustainable society, a more enriching one; and more so when a standard social value measurement system is adopted (Kroeger and Weber, 2014). The initial challenge is ascertaining the nature of SEs, their value propositions and their key to success factors, not only as an ethical goal also as an economic one. Thus, they find several approaches to determine the SE boundaries: a set of required characteristics to qualify as an SE, a formal definition, or an alternative would be to model the SE in terms relative to other social and economic organizations. Of all them, this last one offers a greater, more justified view of the SE field, in theoretical and empirical terms, which translates into the most complete conceptual framework and taxonomy. Even more so when we are aware that achieving a universal definition generally accepted by all parties is hardly possible (Choi and Majumdar, 2014). In addition, it is advisable to resort to institutional statements or reports linked to them issued by supranational organizations with the purpose of viewing the ES from the broadest and longest lasting scope. Nevertheless, the field of action is Europe. Responsible (Socially) Behavior: Management exhibits a high level of social and environmental commitment (i.e. CSR: Corporate Social Responsibility). Non-Profit Businesses: Enterprises whose goals are not generating profit (social or social or environment objectives). Creating Social Value: Provide a solution to a social problem that has not yet been solved. Reinvestment of the Profits: Do not distribute profits among owners, but keep them in the enterprise for future investments. Creating Value: Offer a solution to a need that has not been covered. Traditional Businesses (For-Profit Businesses): Enterprises whose objective is to make a profit for their owners or shareholders. Interest Groups (Stakeholders): Groups of people or individuals affected by the actions of an organization.